Spend a day and a half working through ADVANCED SCENARIOS BASED ON REAL-LIFE PATIENT ENCOUNTERS to treat chronic, acute and neoplasm-related pain! Delve into the anatomy you need to decode notes for everything from office visits to those one-off procedures that your providers throw your way. This two-hour session will start with the seat of sensation – the brain and central nervous system. Next, cover the relevant body structures including muscles, bones and joints. You’ll use the knowledge gained during this session to understand the procedures and diagnosis codes you’ll encounter throughout the conference and when you go back to work. At the end of the session you’ll access your knowledge by playing Name that part! Use unlabeled charts to identify the anatomical structures treated during a procedure. During this session you’ll boost your ability to pluck the diagnosis and procedure codes from notes for pain management procedures that focus on the peripheral nerves. Work on notes for procedures that target the peripheral nervous system. The session will cover common and not-so-common nerve blocks used to treat a variety of conditions. From epidurals to paravertebral facet joint RFA, this session will teach you how to decipher charts for procedures you report every day, with an eye towards avoiding revenue roadblocks, such as tough payer policies with exacting documentation requirements. How should you report an injection of the acromioclavicular joint? What should the documentation for chemodenervation to treat migraine headache contain? What’s the difference between a tendon sheath injection and a tendon origin injection? Review charts for a variety of services including joint injections, chemodenervation of the muscles and tendon injections to get the answers to these and other questions. When blocks and nerve destruction don’t work a doctor may consider more invasive procedures. This session will take you through charts for a variety of pain management techniques, including neurostimulator implants, percutaneous vertebroplasty and minimally invasive lumbar decompression (mild®). This session will include the latest guidance on neurostimulator programming. Your E/M visits are an essential part of your practice and your finances. Auditors are laser-focused on these services, demanding documentation and recouping payments. And doctors have paid large settlements because investigators believed the doctor had upcoded one level. Hone your coding skills on complete and not-so-complete notes for office visits. Get detailed guidance on the six components that are used to determine the level of an E/M visit: History; examination; medical decision making; counseling; coordination of care; and nature of presenting problem. You’ll also get tips for training clinicians to produce documentation that is easy to create and translates into a clean claim every time. Top off the boot camp with a final burst of information. Get the latest on moderate sedation and urine drug screens. Review the new communications-based E/M services and ICD-10-CM updates. Learn the latest trends our experts are seeing. Do you have a coding question that’s been puzzling you? Want to review a note you covered during the boot camp one more time? This session will provide a final opportunity to ask the experts and learn from their answers. Doris Branker is president of DB Healthcare Consulting, a practice management consulting firm that also offers medical coding preparation camps. Doris is a nationally-recognized educator, coding expert, and practice management consultant, as well as an approved educator and PMCC licensed instructor with the AAPC. Her areas of expertise include medical coding, compliance, auditing, billing, and collections management. She holds specialty certifications in E/M, interventional radiology, and cardiovascular coding. Amy has been in the healthcare field since 1989 when she completed her Associates Degree in Nursing at Middle Tennessee State University. She then continued her education at MTSU by receiving her Bachelor of Science in Nursing, followed by a Master’s Degree in Healthcare Administration from the Vanderbilt University Owen Graduate School of Management. 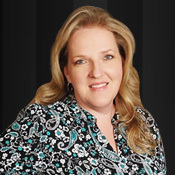 She has been focused on pain management for the majority of her career and regularly presents on pain management billing and coding rules during webinars and live conferences. She is based in Nashville, Tenn.
With this hands-on Boot camp, you’ll be spending at least half of each session working on scenarios. You are required to bring your coding reference materials (CPT Professional, ICD-10-CM, Procedural Coding Expert, or electronic tool) to help you complete the course work. 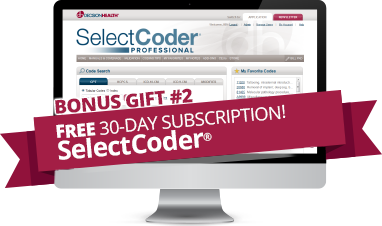 Included with your registration is a free 30-day trial subscription to SelectCoder, DecisionHealth’s premier coding solution that simplifies the complexity of tracking disparate code sets, rules and regulations and streamlines them into a single, consistent online coding system. 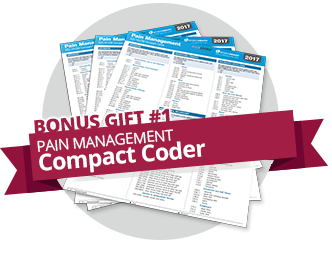 Search the most current CPT ®, ICD-10-CM, HCPCS Level II and modifiers by key terms or abbreviations. SelectCoder training will be provided ahead of the Boot camp. For room reservations, contact the hotel directly and mention you are attending the Pain Management Coding Boot Camp to take advantage of discounted rates. To receive the discounted rate, reservations must be made by Monday February 24, 2019, or until the room block is full. Thereafter, reservations will be taken on a space and availability. Book online today! Simplify Compliance/DecisionHealth has no affiliation with any third party companies or travel assistance providers. Hotel rooms should be booked directly with the hotel via the official hotel information listed on the website and registration brochure. Send your team of three or more and save an additional 10%! Your savings will automatically calculate in your cart when you register. Prefer to register by phone? For multiple attendee discounts, contact Megan Ireland 1-855-225-5341 x6025 or mireland@decisionhealth.com. Call our customer service team at 1-855-CALL-DH1 or email customer@decisionhealth.com. Click here to view our event registration policy.